Greg Humphrey has come through for us again. In an article elsewhere on this site, Greg identified the author of the the famous Kinne letters of Oct 1896 as described by Jill Foley. He married a Great-granddaughter of Peter and Elisabeth. The connection by marriage gives more credibility to other information about the Hazelbaker family in those documents. In the letter, Kinne attempts to collect money and authorization from Hazelbaker heirs in order to claim an inheritance in Germany connected to Peter's mother. Was this a legitimate undertaking, or a different sort of Nigerian-letter scam? There has been no way to really know. Greg uncovered a passport application for L.B. 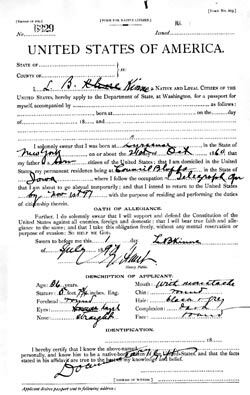 Kinne dated July, 1897 for travel ending Nov 1, 1897. This potential trip would have occurred less than a year after the "Letter" was written. However, where did Kinne go, and when was the land transfer event in question? The story Peter told to his son John must have been before Peter's death in 1800. Oldest son John himself died in Iowa in 1864. The inheritance of a sizable piece of land is said to be due to Peter from his Mother. Where might that have been? There was the Hazelbaker house in Münchsteinach. I have little concept of whether the Hazelbakers "owned " a house, or would have been permitted to own a house in those times. One of my ancestors in Diespeck appeared to have owned a piece of land in the early 1700s so I suppose it was possible. However, the Münchsteinach house was inhabited by Peter's older brother Balthazar until he lost the house through bankruptcy and transgressions against church rules (i.e. infidelity). Balthasar had to live his final years in a different house. House Hasselbacher (#55) housed Balthasar's son Peter, and then his granddaughter Katharina until 1880 or so. Peter would probably have known that his older brother was living in the family house and would not have expected to inherit. I do not know if it would have been permitted for Peter's mother to have inherited property in those times but there were other male heirs in line anyway. My contacts in Münchsteinach are pretty good, so it might be possible to find old records that illuminate these events. "mit Helena Barbara Langin, Mstr. Georg Langens, Müllers zu Burghaslach ehel. anderen Tochter, noch ledigen Standes, sind nach dreymaliger Proclamation d. 5 Junii mit einer Predigt zu Mönchsteinach copylirt worden." I understand this to mean that Helene Barbara was the daughter of the Master Miller Georg Lang of Burghaslach, his legitimate other daughter who was still in the unmarried state, and who after the required proclamations in church was married in a ceremony with a sermon or homily. The occupation of miller was a pretty substantial one. In some places people were required to take their grain to be milled in a specific mill. In Württemberg where there were other millers in my family, the trade passed from father to oldest son. I know little else about Georg Lang or his family, but it might be possible to find out. If there were no sons, property might have passed to the daughter. Relevant to this discussion is the fact that there were Hasselbacher cousins of Peter who were millers living in Burghaslach about that time. I have speculated this is how Peter's father Johann Georg might have met his wife. 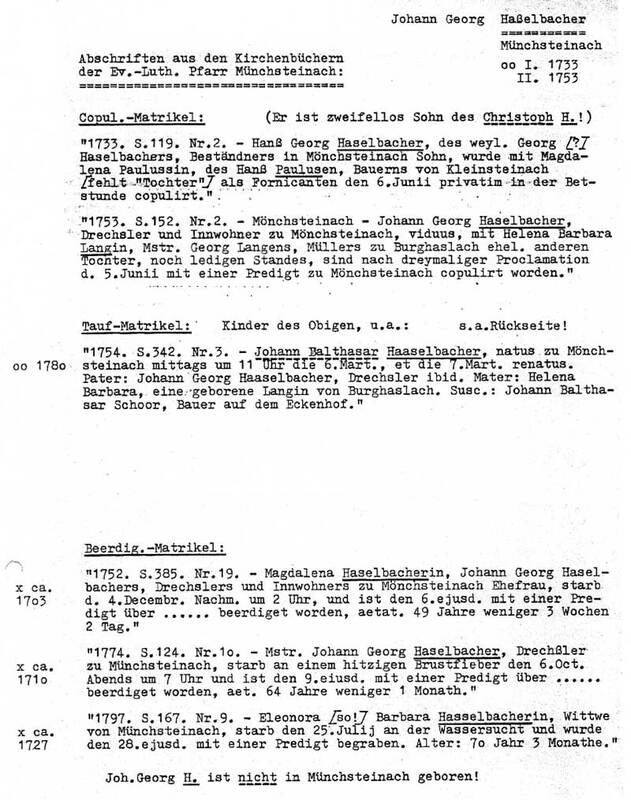 This possible connection to Hasselbachers of Burghaslach leads to the only early connection to Ansbach of which I am aware. The Burghaslach line of Hasselbachers eventually ended up in Ansbach where there was a potential temporal overlap with Peter and/ or his mother. Stretching speculation the farthest, it is possible that an inheritance might have been in Ansbach. In the Kinne Historical sketch, it is said that Peter was the only son of his mother. I know that to be incorrect, but it occurs to me that Kinne's position would be viable only if Peter was the last surviving heir! There may have been a bias in his account! Of course, most of the above is the result of speculation, but at least it suggests some places we can look. The finding of the passport application of Kinne lends at least some support to the validity of the other family history that comes to us through him. Peter Hasselbacher, 26 Feb 2011. Contact me.